This is a "desktop business minicomputer", manufactured by NEC of Japan, back in 1983, and I came by it as I worked for NEC Information Systems in Massachusetts back then. The FORTH compiler I ported to it was allegedly the first interactive language for the NEC Astra minicomputers, so it generated some interest on the part of the NEC people in Japan. As I recall, the processor is a "Mucom 1600", bit slice processor, emulating the processor on the larger NEC Astra minicomputers. The instruction set is very similar to the DEC VAX. 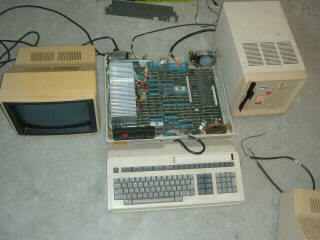 So much so, that I was able to port the FORTH language from a VAX distribution to this machine, and it still works. I think 384k memory. The hard disk drive is 10Mb, and includes built-in 8" floppy disk. In 1983, it cost something like $6000 for just the hard drive, and that was a lot of money back then. Besides the monochrome monitor, I also have a color one that still works, but it is much larger, and the display is not very bright. This is the first time these have been powered up since maybe 1988 or so. I had to clean the heads on the floppy drive to get it to boot, it does not boot directly off the hard disk, but instead you have to boot off the floppy first. I've had trouble getting it to boot recently, I may have sucked all the remaining magnetism out of the boot floppies, in which case this is terminally dead hardware. I have lots of "interesting" software for it, including compilers like COBOL, FORTRAN, CPL (like BCPL, see wikipedia), and of course the interactive FORTH compiler that I ported to it. Also a bunch of games like blackjack, golf, etc. Communication emulators like 3270, 3780, etc. And software for keeping track of golf tournament scores.